As its theme, Elysium borrows a title, but nothing else, from Hemingway: to have and have not. 140 years from now, Earth is a ruined dustbowl of a slum populated by the Have Nots, most of whom are depicted as the sweaty, unwashed, Spanish-speaking masses we today consider minority races. The wealthiest Haves skedaddled from Earth and seemingly pooled their vast resources to build a multi-kajillion dollar space station in which to live; a heavily guarded orbital haven they for some reason dubbed "Elysium." Oh, it's wonderful up on Elysium, young orphan Matt Damon assumes as he gazes up at that silver wheel floating yonder overhead from his shanty down in what's become of Los Angeles (South Africa doubling for LA). Up there, they have magical bio-beds that can heal any illness, and everyone has a swimming pool in the backyards of their McMansions, like the kind you'd see in modern day Santa Barbara and Malibu. Elysium is more or less Epcot Center in space. The food court must be pretty awesome on Elysium. The creamy pantsuits running Elysium's security are worn by Jodie Foster, sporting a weird pseudo-French accent. Foster schemes to have the duly elected President of Elysium kicked out of office so she can run her space station without being called to the carpet every time she shoots down a transport shuttle full of illegal immigrants trying to sneak onboard. Foster is harsh and ambitious but not bright. She enlists the Tony Stark of Elysium, billionaire weapons magnate William Fichtner, to rewrite Elysium's computer codes to shitcan the President and put her in fully in charge, in exchange for a 200 year exclusive contract. It's weird because doesn't Fichtner have the exclusive contract anyway? There don't seem to be any other competing billionaire weapons magnates on Elysium. Foster also doesn't trust any of the rejects from the Robert Palmer "Simply Irresistable" video working for her and secretly employs skeevy mercenary Sharlto Copley to do her dirty wetworks on Earth. Clearly, Foster makes excellent choices that don't end up stabbing her in the neck. Meanwhile, Matt Damon grew up to be a convicted carjacking felon who toils on the line in one of Fichtner's robocop assembly factories. Damon is chagrined to make his meager living slapping together the droids that in turn harass him and break his arm when he's waiting for the bus to go to work. Through the negligence of his superiors, Damon is exposed to a lethal dose of radiation. His medical droid informs him with hilarious bedside manner that Damon will undergo catastrophic organ failure and die in five days. Desperate to live, Damon's only hope is to get to a medical bed on Elysium and be magically cured. To do that, he takes a job for the local crime lord and has an exo-skeleton fused to his body, giving him superhuman strength and the endurance to conveniently ignore his fatal disease for most of the movie, unless the plot calls for him to remember he's dying of radiation poisoning. The mission: to kidnap Fichtner and steal the data in his head via bio-link download file transfer whatever. The mission goes sideways when Copley and his crew of roughnecks intervene, Fichtner is killed, and so are most of Damon's guys. Damon also had no idea exactly what he downloaded from Fichtner's head, which turns out to be the code to reboot Elysium completely and make everyone a citizen. A lot of chasing and bloodletting in the form of cyberpunk ultraviolence ensues as Damon rather easily gets Copley to take him to Elysium, only to learn his childhood sweetheart Alice Braga and her daughter dying of leukemia are also headed to Elysium as Copley's prisoners. 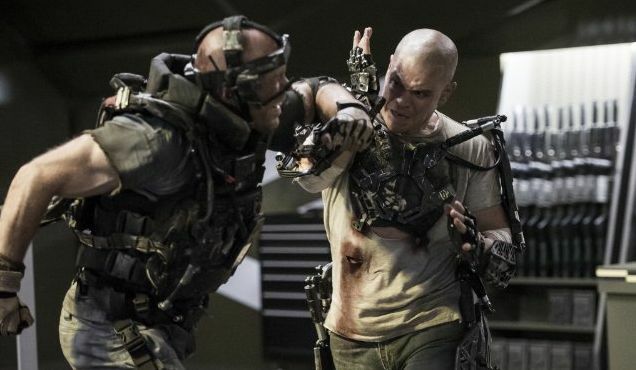 Looking like a cyborg version of Bane, the bald, jacked up Damon turns into an unlikely revolutionary, trying to stop Copley's #OccupyElysium movement when Copley decides he should be in charge of Elysium. Bit by bit, Elysium lets the audience in on what's really on its mind: universal healthcare and the idea that everyone on Earth is entitled to citizenship and thus all the magical healing capabilities withheld from them by the rich people of Elysium. No one bothers to ask any of the inhabitants of Elysium how they feel about any of these political issues, but then Elysium seems oddly underpopulated and the people we do see appear too concerned with posing for photoshoots for the Elysium version of Vanity Fair. So as it happens, Damon succeeds in his sloppy, violent revolution and the code of Elysium is rewritten so that everyone on Earth has a chance to have a medical droid hit them on the knee with a ball peen hammer and cure what ails them. It's a happy ending, at least until someone else rewrites the computer code and sets Elysium back to the way things were.